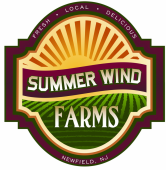 Summer Wind Farms has partnered with Samuels Seafood, the premier seafood source for the finest restaurants in the Philadelphia area. Samuels is the go to spot for Wild Alaska Salmon. We'll be bringing in Wild Alaska King Salmon and Sockeye Salmon. Many Alaskan vessels are reporting the best catch in 10 years off areas such as Kodiak and the South Alaska Peninsula. Lately, fishing has also started to get exciting in the famous Bristol Bay. Our Wild Alaskan Salmon is FRESH, never frozen. Samuels actually FLIES this fish in to Philadelphia three or four times per week right from the fishing piers in Alaska. You are getting the absolute best quality Wild Caught Alaskan Salmon money can buy. Our Salmon is sold as a TWO whole skin on sides, so you are buying the WHOLE FISH, however it’s been fileted for you by Samuels expert fishmongers. Estimated weights for each species of Salmon are listed below. The actual weight MAY VARY and you will be billed or receive a credit when you pick up based on the actual weight of YOUR FISH. Pick up is at our farm market located at the Dutch Wagon Amish Farmer’s Market 109 Rt. 70, Medford, NJ. Pick up is either Friday or Saturday. You must order in advance, by Wednesday at noon, for pick up that weekend. The same as our regular seafood program. King Salmon sides average about 3 ½ pounds per side so you are buying about 7 pounds of salmon. Sockeye Salmon average about 1-2 pounds per side, we use the higher weight, so you are buying about 4 pounds of salmon. That may seem like a lot of fish, so we recommend finding a friend or relative who enjoys the finest in seafood and split your fish with them. You could also freeze what you don’t cook right away. This salmon is very fresh and it freezes great. Use a heavy-duty freezer bag or better yet a home vacuum sealer. Wild King Salmon, commonly known as Chinook salmon, is a succulent full-flavored high fat content fish which has the highest omega-3 oil content and most velvety texture. It is a delicious, rich-flavored fish which lends itself to a wide variety of cooking applications. The flavor and texture of King Salmon is full, rich and pronounced with a buttery and delicate texture and large, soft flakes. The color of King Salmon varies from almost white to pink to red. The color has no effect on flavor. King Salmon sides average about 3 ½ pounds per side so you are buying about 7 pounds of salmon. TWO whole sides @$175.00, final weight is priced out at $24.99/Lb. Fresh wild Sockeye Salmon has the firmest, reddest flesh of all wild Pacific salmon. Sockeye Salmon is a fabulously full-flavored fish with a high fat content which contributes to its rich flavor. It has a firm-texture with medium sized flakes and flesh which ranges in color from orange to deep red.Sockeye Salmon average about 1-2 pounds per side, we use the higher weight, so you are buying about 4 pounds of salmon. TWO whole sides @$79.00, final weight is priced out at $19.99/Lb. What are the differences between the two species of Salmon? King Salmon is the larger species and sells for more per pound than Sockeye. It is the species of Salmon you are most likely to find on very high-end seafood restaurant menus. Compared to King Salmon, Sockeye has a denser, meatier texture and a more intense flavor, while King has a more succulent, tender texture with larger flakes. King Salmon has a higher fat content and therefore a more luxurious texture, and its flavor is a little less “wild” or robust. It is like the difference between a fillet mignon and a New York steak…both are equally good, it’s a matter of personal preference as to which you enjoy more.